We like to think that everyone was so polite and proper during the 1860's and maybe they were by today's standards. However, as one person observed, there probably wouldn't have been so many discussions of etiquette if there hadn't been the opposite behavior to correct. The complete title of the book would require several lines but provides a good summary of the contents of the book. It provides ample advice for most of the types of interaction that would have occurred to people in the nineteenth century, from writing letters to conduct at balls. There is even a section which few of us would have occasion to use for "Etiquette of Horseback Riding." Although written for the people of the 1860's, this book is also useful to today's reader. 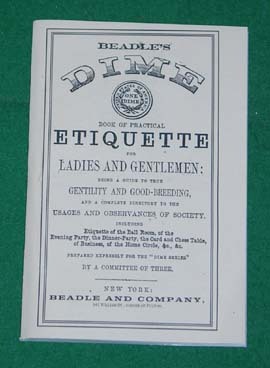 Many elements of etiquette are timeless.